How do you create a project folder? — . :: GSA SEO & Marketing Forum ::. How do you create a project folder? 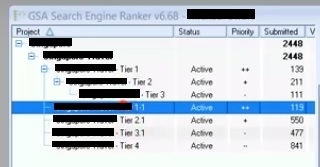 and to create a next level which Im guessing is just the money site url to link the tiers to. Sorry if I'm being blind but there is no option under your instructions to create an encompassing project folder that collates all the submitted and verified within the project as seen in the screenshot. Could you be more specific please? Well what else do you need to create a new group ? That group is same as the project folder.